Just kidding, he’s telling us to get back to work…. 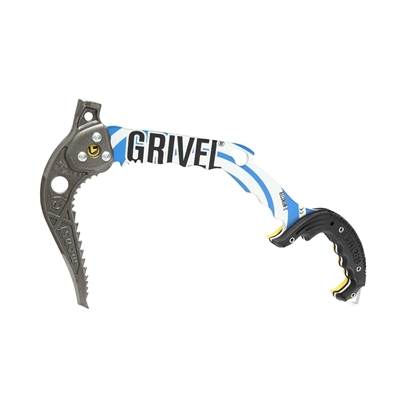 Grivel not only has a long history of alpinism, they make some of the most innovative, ultra light, and user-friendly ice tools and mountaineering equipment on out there. They are Italian made, and their headquarters are located at the base of Mount Blanc, the highest (and probably most breathtaking) mountain in the Alps. There is no doubt the Grivel tools are a product of their environment in more ways than one. The innovative X-Monster is a lightweight and versatile tool for all grades of ice and skill levels .The shaft is slightly straighter and the grip is better for vertical walls. The flexible shaft that so many climbers have recently discovered makes anchoring into cracks, including non vertical ones, easier and safer. Just remember the progress made on changing from rigid to flexible vaulting poles! The rear is almost a hammer shaped like “nuts”, ideal for anchoring and torquing in larger cracks on mixed terrain or with the a more classic shovel. Grivel’s easiest ice screw. Easy to get the first bite in the ice thanks to its symmetrical grip. Easy to screw in thanks to the handle on the grip. Easy to attach a carabiner thanks to the shape of the ring. Easy to carry on the rack with a carabiner, even several at a time. You’ll find that Helix has all the fantastic qualities usually found in a Grivel screw, the ones that have made them famous worldwide and the reference in ice screws. The evolution of modern ice climbing techniques push towards a more fluid motion, more elegant and faster, therefore it demands a crampon that makes it possible: a technical crampon, and a super-light one. G20 is a crampon 100% technical, reliable, efficient and the LIGHTEST IN THE WORLD: less than 800 grams per pair! The new MONO-RAIL technology (patented) distributes the 12 points in an intelligent and original way. MONO-RAIL provides ice penetration power and increases your climbing efficiency. Shop Grivel on Outdoor Prolink. Not a member? Apply today!